For much more excellent footage from the global climate action events, please visit www.youtube.com/350org. With thousands of industrial jobs cut, the recession has hit France in a big way. In retaliation, French workers have protested, marched, gone on strike....and written viral rock anthems? 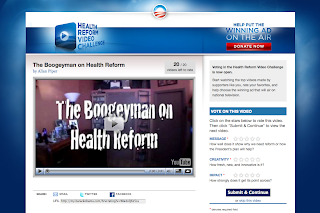 Earlier this fall, the Organizing for America and the Democratic National Committee asked citizens to create 30 second ads supporting health care reform for the chance to have their video aired on television. Many submitted videos through YouTube. Now, they've picked their 20 finalists, and are asking you to vote to select the winner. You can cast your vote at http://my.barackobama.com/page/content/hrvcratings. Citizen votes and the opinion of their judges, including will.i.am, Seth McFarlane and Tim Kaine, will decide the ultimate winner. The YouTube community, which seemed to support Ann in her first video, appears to be more wary of her this time around. Perhaps it's because the last two minutes of this video are devoted to selling "Debtor's Revolt" t-shirts? Earlier this month, through the YouTube Video Volunteers program, we asked you to create an amazing video on behalf of your favorite animal welfare organization and submit it for the chance to be featured on our homepage. On Saturday, you voted on which videos you liked the best, and today the top three are featured on the homepage alongside a video for the Humane Society from actor Ben Stein. If you'd like to view all of the videos that were submitted, you can visit the Video Volunteers channel and click "Gallery." Didn't have a chance to make a video for this month's round? Don't worry. We'll be kicking off our next installment of Video Volunteers on November 1, focusing on hunger in America. This month's round of Video Volunteers invited users to submit videos on behalf of their favorite animal welfare organization for the chance to be featured on the YouTube homepage as part of a special spotlight collection. We received over 100 excellent submissions from YouTube pet lovers about animal shelters, national wild-life protection agencies, and no-kill organizations. Our celeb curator Ben Stein and partner the Humane Society have picked their top 10. Now it's up to you to decide which three videos deserve to be recognized on the YouTube homepage, alongside Stein's. Voting starts at 12:01 AM today (10/24) and lasts for only 24 hours, so get your votes in now at www.youtube.com/videovolunteers! Yesterday, the Senate passed the Matthew Shepard and James Byrd, Jr. Hate Crimes Prevention Act which expands the definition of a hate crime to include gender, disability, sexual orientation and gender identity. The bill is now headed to President Obama's desk for his signature -- Obama has already pledged to sign the measure. Earlier this week, we blogged about the Yes Men's prank on the Chamber of Commerce. In accordance with the prank, the Yes Men also set up a fake website at www.chamber-of-commerce.us. The Chamber of Commerce has issued a Digital Millennium Copyright Act (DMCA) takedown notice against this site, citing that the site constitutes copyright infringement. The Chamber is asking that the site be taken down immediately. The Electronic Frontier Foundation is defending the Yes Men's right to keep the site up. Bus driver caught on camera...driving while playing sudoku? Another video has been posted to YouTube showing a public transportation operator caught doing something they shouldn't be doing while driving. In this case, a Vancouver bus driver is documented on camera playing Sudoku on the job. Some are saying that this prank compromised journalist credibility; other activists are saying that it was an effective way to raise the volume on the issue of climate change. And still more found the whole thing quite hilarious. Last Friday, on World Food Day, we asked you, the online billion, to turn your YouTube views into action to feed the billion hungry people in the world. You blew us away with your response, collectively donating enough money to the United Nations World Food Program through this video to give school lunch to close to 140,000 children. And your donations are still coming in. Added Pierre Guillaume Wieleznyski, WFP's Head of Online Communications, "It is heartening to see the YouTube community step up and help. We often forget about the billion people who to bed hungry. If every web user does a little, we can achieve a lot." YouTube user angelinthesky26 echoed this sentiment, commenting "we﻿ can all make a difference in our own simple way." So, thank you YouTube, for making a difference. We're incredibly inspired by you. Here's Coach Carroll on ESPN talking about the organizations work and why it's important. Last week I attended the Alliance of Youth Movements summit in Mexico City - which brought together a great collection of young people who've been using various online tools to help promote human rights and social change in their countries. People who used twitter to fuel a revolution in Moldova; a young man who used Facebook to organize mass protests against the FARC in Columbia; and groups who've used YouTube to shed light on child soldiers in Uganda or document the election protests in Iran earlier this year. YouTube and Google were sponsors of the event and we participated in a few panels - one on "viral video" brought together a great collection of experts (Levi Felix of Causecast.org, Liebman of Howcast, Kelly Niknejad of Tehran Bureau, and Ari Wallach, the creator of The Great Schlep) who all had great advice about how to use video to create change, and just generally how to get your content discovered in today's over-saturated online environment. Here's a clip of the panel; you can find more on the AYM hub. AYM also just named a new executive director, David Nassar of Blue State Digital, to lead the organization moving forward. There aren't many organizations out there with the purpose and mission of AYM who have the ears of the same collection of tech companies that AYM does... we're looking forward to working with David and team as they use the network they've created to further our understanding of how platforms like YouTube can be used for social change. We missed this one late last week, but worth a look... we told you about the YouTube feud between Newark Mayor Cory Booker and Conan O'Brien on the Tonight Show... and now, like all good online feuds, a face-to-face meeting settled the score on live television. And Conan handed a Newark nonprofit that Booker founded in 2003 called Newark Now a $50,000 check to make up for the disparaging remarks he'd made about the city. "It was one joke, but man was it expensive," Conan quipped on the show. New videos from the Republicans and Democrats this past week show that health care is still very much the top priority for both parties. The ultimate example of the raw power of eyewitness footage, this unbelievable video shows a stroller, complete with baby inside, roll onto the train tracks just seconds before a train passes by. Miraculously, the baby survived with just a bump on his head. United Nations picks its YouTube "Citizen Ambassadors"
Last month, the United Nations and U.N. Ambassador George Clooney asked citizens to post videos detailing what they would say to the United Nations General Assembly if they were given the chance to do so. The U.N. received over 475 videos to become a "citizen ambassador" to the UN. If you take a look at the comments, the video, released in anticipation of World Food Day this Friday, is definitely stirring up a lot of controversy. Can we expect a video response from the Pope on his YouTube channel? First-term Sheboygen, Wisconsin mayor Bob Ryan is learning the perils of barroom chit-chat between guys when you're in a position of public office... This clip just surfaced of the Mayor making some disparaging remarks about his wife's sister; and here is his apology on WLUK-TV in Wisconsin, which is almost as awkard. Ryan calls the incident, a "conversation between men in an establishment". Today I'm headed to the 2nd annual, Alliance of Youth Movements conference in Mexico City. Launched last year in New York by the U.S. State Department and Howcast (YouTube and Google are among the sponsors), AYM's mission is to "positively empowers leaders to affect nonviolent change in the world by creating and promoting use of technological tools to advance freedom, human rights, democracy, and development around the world." Basically, it's a tech conference for social movements. In the year since the first AYM conference, there's not doubt that the election protests in Iran have been the highest-profile case of young people using technology to advance freedom and human rights - thousands of YouTube videos uploaded from the streets of Tehran became the only window into the violence after the foreign press was kicked out by the Iranian government. But there are hundreds of other cases in which young people have been using technology to fight for their rights, and the conference in Mexico City will serve to highlight these examples and allow activists to learn lessons from one another directly. No doubt the use of technology to combat Mexican drug cartels will be at the top of mind for many of the local participants in the conference. I'll blog from the conference but you can also stay on top of things by watching the AYM YouTube channel, here. We're excited to see the launch of a new company today called Factual, whose mission is to "make data more accountable". Factual provides open access to better structured data (think of structured data as the kind of data you find in tables) by compiling exhaustive data sets on topics ranging from endocrinologists to American Idol finalists - and making that data open/sharable/mashable. Publishers, developers, or your average everyday "data enthusiast" can create their own tables, mash their data with others, and create bigger and more accurate spreadsheets of information that are embeddable across the web. The political applications of Factual are easy to imagine: government spending and campaign contributions are the quickest to come to mind. Last year, when we were preparing to launch Video Your Vote - the voting accountability project we did with PBS on election day, it took us forever to collect all the laws from every state regarding video camera usage at polling places. A team of researchers at Harvard's Citizen Media Law project spent a day helping us compile and interpret the laws from every Secretary of State's office. With Factual, that job would have been a lot easier - we could have dropped each site's URL into Factual.com, and all the data would have been extracted and structured instantaneously, ready for edits and interpretation from a broader community. If you're a member of the YouTube Nonprofit Program already, you're good to go. And if you're a 501(c)3 in the U.S. or registered charity in the U.K., you can apply to the program now at www.youtube.com/nonprofits. I have to agree with Kotecki...however silly the videos may seem, it's refreshing to see campaigns taking a lighter, more YouTube-friendly approach to web video. For announcements of all the Nobel Prizes from this week and special interviews with the winners, please see the Nobel Prize YouTube channel. During the 70's and 80's several Latin American countries endured tumultuous political movements - military-run governments in these states clamped down on freedom of speech and held a very tight grip over the media. As often happens in these situations, great musicians tried to address these situations with their art. In the case of Argentina, Brazil, Chile, Uruguay and other countries, Mercedes Sosa, "La Negra," played an important role as the "voice of the voiceless." To the dismay of her many fans, Sosa died last Sunday. To mourn the loss of a beautiful voice and the creator of the Free Song movement, the YouTube community has been watching and sharing some of her greatest songs. Mercedes Sosa was a great artist who used her amazing voice to represent and fight for the people living during those hard times. -- Posted by Ricardo Blanco, YouTube Communcations Latin America, lately watched "¡Gracias a la Vida! Mercedes Sosa in Israel"
We noticed this video rising today on YouTube and asked an Iranian colleague here at YouTube just what was going on. Apparently, the two men in the video are the president and vice president of a bloodbank in Yazd, Iran, and they're trying to promote blood donations by giving blood themselves. Only problem is, they were faking it. When the videographer was brave enough to pull back the gauze on their arms, he revealed the needle wasn't breaking the skin. In the video description and the comments, there's a debate going on over the incident. Some state that the head of the blood bank was replaced because of the video. Others claim that he was ready to donate blood, but the reporter asked him to let them shoot the video before the blood donation instruments would be ready, and he accepted - only to fall into the trap. Our colleague says it's hard to confirm which is true, due to the unreliability of Iranian state TV. Levi Johnston, father to former VP candidate Sarah Palin's grandchild, has found himself a new gig. Selling pistachios. Watch for yourself. Answering questions submitted on Google Moderator and YouTube, Virginia gubernatorial candidates Creigh Deeds and Bob McDonnell signaled that their contest is being influenced by the national political mood. Tonight is the second in our series of Virginia gubernatorial election TV interviews that we've partnered on with the Politico and WJLA. Republican Bob McDonnell and Democrat Creigh Deeds will take your video and text questions at 7 pm EST (the interviews were pre-taped), in a discussion with WJLA's Leon Harris and the Politico's John Harris. For those of you not in Virginia, we'll feature the archived version of these interviews as soon as they're up. Yesterday, the Brazilian Federal Supreme Court launched its official channel on YouTube, making it the first supreme court in the world to take advantage of YouTube to leverage its own transparency and use online videos to provide better information to the people. The Brazilian Supreme Court has a long tradition of openness and has been live broadcasting its sessions for more then a decade now. The channel contains highlights of the Supreme Court sessions, educational content produced by their own TV channel, and records of historical passages of the Brazilian Judiciary Branch. The National Council of Justice, the highest administrative authority of the Brazilian Judiciary Branch, took the opportunity to launch an official YouTube channel as well. The channel offers a lot of useful information to citizens, especially on their fundamental rights and how to protect them. The two channels together represent a unique source of relevant legal information translated into everyday language. We hope that these launches will encourage other public institutions around the world to follow suit, and that in Brazil and Latin America, these channels will foster openness and transparency, improve communications with the population, and stimulate regular citizens to participate in public debates. This week, Nobel Prizes will be awarded in a variety of categories, and for the first time, you can follow the proceedings live on YouTube. Starting today and ending on October 12, YouTube users can tune into the Nobel Prize YouTube channel for live-streamed announcements of each Prize. This marks the first time that a European event will be live-streamed via YouTube. The Nobel Prize in Physics will be awarded tomorrow. To view a complete schedule of when other prizes will be announced on YouTube, please click here. You probably learned about Anne Frank through the pages of an old textbook -- children now have a more robust alternative. Other must-see videos include this interview with Otto Frank and this clip of Nelson Mandela talking about how Anne Frank inspired his work. The Anne Frank House is also building a virtual museum in homage to Anne, which you can tour through this video. Like many of you, actor Ben Stein cares deeply about animals (especially his dog Puppy Wuppy). That's why, with World Animal Day right around the corner, Ben is calling on you (and your pet, if you like) to make a video on behalf of your favorite animal welfare organization, as part of YouTube's Video Volunteers program. This is just the beginning: each month, we'll feature a different relevant issue on the Video Volunteers channel with a new guest curator, and you could have the opportunity to showcase your work (and favorite org) to a huge audience. For this month, you have until October 22 at midnight PT to submit your video to www.youtube.com/videovolunteers, so grab your camera and use it to make a difference! Then make sure to vote on October 24 for the videos you'd most like to see featured on the homepage. Mayor Cory Booker has been using YouTube more effectively than almost any big-city mayor in the country (though Mayor Bloomberg may have something to say about that). He posts weekly clips talking about what he's up to in Newark, New Jersey, a city he claims is "on the rise." He also does Q and A sessions with citizens, and films most of his public appearances. Smart move. Getting ahead of O'Brien with a timely and funny response shows the Mayor knows how to laugh, but also has the guts to defend his city on a national stage.